DOPEY ENTERTAINMENT LIBERALS MAKE FOOLS OF THEMSELVES. 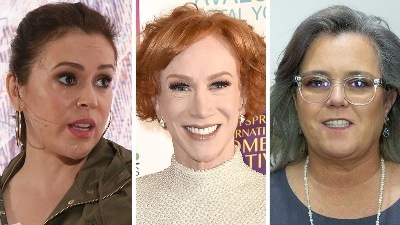 Alyssa Milano, Kathy Griffin, Rob Reiner and Rosie O'Donnell all slammed President Trump after illegal aliens stormed the U.S. border Nov. 26, 2018. "These asylum seekers should be welcomed to our country and President Trump should be sent to prison," Kathy "bloody head" Griffin tweeted. Poor Kathy is so ignorant she does not know this is exactly what President Trump is doing. Rosie O'Donnell, apparently thinking it was President Trump hurling rocks and bottles at border agents, said the border clash was "pure horror" and called for the removal of President Trump. Actor Rob Reiner - so ignorant he had no idea that the Obama Administration had also used tear gas on women and babies, wrote: "Don’t know how you get lower than tear gassing babies. But if anyone can, Trump will find a way. We must never get used to the horror that is this President." Alyssa Milano, as ignorant of reality as Rob Reiner but much more vulgar also slammed the President tweeting at him: "You tear-gassed women and children, a--wipe! And on Thanksgiving weekend, you piece of s--t, a--hole, motherf--king, evil-creature-person!!" CLICK HERE FOR DETAILS: http://boomerspeaks.com/12601.html . GODLESS DEMOCRAT ENTERTAINER SAYS "the only white people that thank Jesus are Republicans and ex-crackheads". An oh-so-funny black comedian said at Monday night’s (9/17/2018) Emmy awards that white people don’t thank Jesus enough, and it’s only the bad ones anyway. 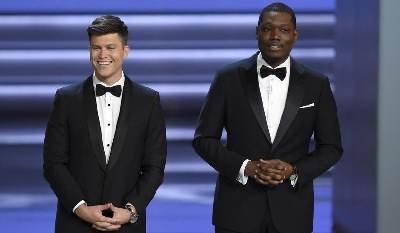 During the opening monologue, co-host Michael Che joked with fellow “Saturday Night Live” cast member Colin Jost that his mother wouldn’t be watching. 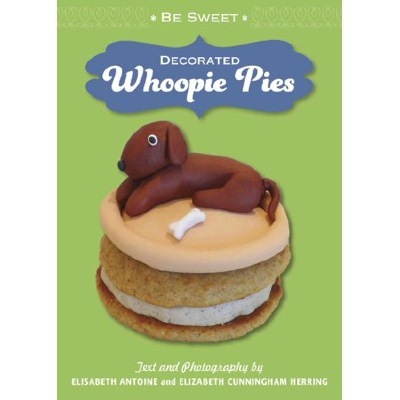 Mr. Che went on to agree with the words he attributed to his mother and making a further anti-white joke.“That’s true. The only white people that thank Jesus are Republicans and ex-crackheads,” he said. BABS STREISAND CONFIRMS HILLARY DID WIN THE ELECTION. GEORGE CLOONEY THINKS HE'D MAKE A GOOD PRESIDENT. Streisand sat down with Variety for a two-hour conversation at her home in Malibu for this week’s cover story. In addition to talking about male sexists, and how they impacted her career as a director and producer, Streisand also shared her thoughts on Trump’s presidency. Here’s what she had to say about why Al Franken should have never resigned and if Clinton should run again in 2020. The aging movie star also indicated she wanted Trump impeached. She said, “I sure hope so. I’m so upset by a crazy person. I call him the liar in chief, the misogynist in chief. He’s so crazed.” Barbara complains that Trump’s presidency changed her art. CHER'S HATRED FOR TRUMP EXPLODES. Cher is one of Hollywood’s biggest President Trump haters. The famous pop singer not only announced she would leave the country if Trump won, she pathetically said, “I’m going to have to leave the planet.” And Cher’s latest anti-Trump tweet will make your eyes roll. In talking about a Trump cabinet member she tweeted, "I Hope Any poison He’s Allowed To come in contact with innocentChildren,comes back to him 10,000 TIMES"
DOPEY JOY BEHAR ATTACKS TRUMP'S SUPREME COURT NOMINEE. Joy Behar went on a hilarious and hysterical rampage after Trump chose Brett Kavanaugh for the Supreme Court. Women “Need Abortions”, she said, imagining that Kavanaugh would somehow, impossibly, ban abortions throughout the United States. Behars' rants included asking why Mitch McConnell is not in jail. She remained unhinged, even while other liberals tried to calm her down. 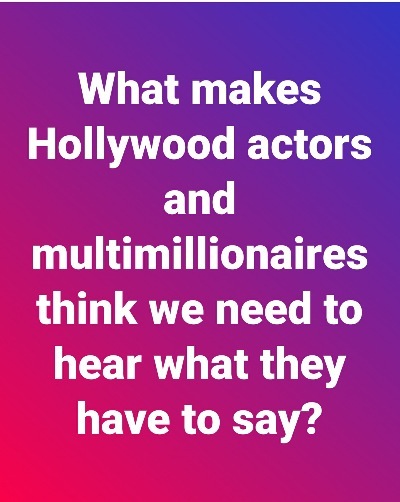 The evil Trump is making Hollywood's elitist self deport themselves. What can we possible do to make up for the United States losing Madonna? 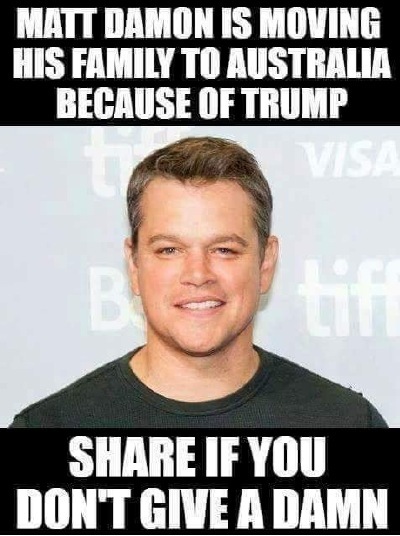 MATT DAMON is so terrified of Donald Trump he has moved to Australia. MICHAEL MOORE WANTS YOU TO PUT YOUR LIFE ON THE LINE TO STOP TRUMP. 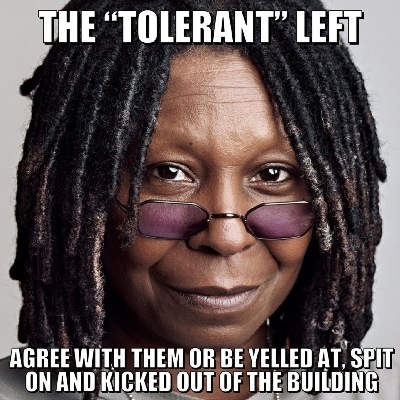 WHOOPI GOLDBERG IS A CHARTER MEMBER OF THE INTOLERANT LIBERALS IN HOLLYWOOD. Actress Natalie Portman compared consuming meat to crimes committed during the Holocaust in a video paying tribute to famed writer and animal welfare rights activist Isaac Bashevis Singer, released by People for the Ethical Treatment of Animals (PETA). Hollywood entertainment stars show their elite wisdom in all things, from politics to eating.